‘The Real Thar’, that lies West of Jaisalmer, in Rajasthan..
Because >>> Truly, The Real Desert lies West of Jaisalmer, in an area which is ‘closed’ to visitors, being in the ‘Restricted Zone’ adjoining the Indo-Pak Border. Some of the places can be reached only on camel-back. 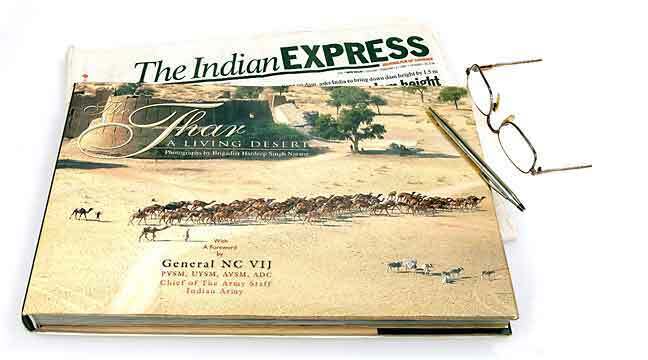 It is for this reason that there have been no Pictorial Books about the Real Thar Desert. This Book brings you a glimpse of those remote regions. · Large Double Spreads, many covering the entire length of the Book, ….. over Two Feet (650mm) wide, is the hallmark of this Book. · Aerial Views, of inaccessible Desert Terrain; of habitations; of land patterns; of activities in remote ‘desert pastures’; are not easy to make. Only by luck, and after considerable number of ‘Flying Hours’, and heaps of Film Rolls, may one capture the views that are repeated page after page in this Book. · Composite Thematic Layouts. On Each Facing Page: There are long-shots of Distant Views, set at the center of the double spread page, accompanied by ‘close-up shots’ of ‘Life at Grassroots’ placed adjacently. A holistic experience at one glance. Every page is arranged as a ‘Thematic Exposition’. · Limited Print Run, just one Thousand copies make this a ‘Collectors’ Item’. Because the Book is so Unique and Different, it may not be clubbed with other ‘Coffee – table’ books. This a ‘Work of Art’ portraying the “Spirit of The Desert”. You might agree that this is not a ‘run-of- the-mill’ publication. · The Book is Unique, it is a collectors item ! yet it is reasonably priced, …. .. cheaper than other Books in the same category. >>>> Of Interest to All. The Romance and Reality of the Desert, captured in many a rare and revealing pictures. The panoramic view of the varied Terrain Features, and other Characteristics of the Desert. It may well be considered as an Informal Pictorial Introduction to the Desert: A Supplement to Official Descriptive Notes, Pamphlets, Research Papers and Narratives. It caters to the need of all those who are in any way associated with the Desert, and wish to know more about not only the Remote Desert Regions, but of India as such. Its value in furtherance of explorations into ‘Nature-Study’, ‘Environment’ and ‘Geography’ is obvious. 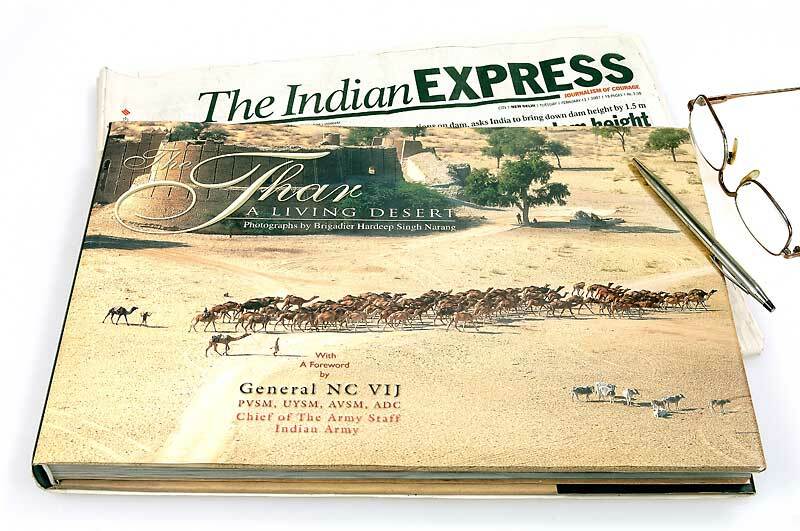 Title: The Thar –A Living Desert, Photographs by Brigadier Hardeep Narang. With a Foreword by General NC Vij, Chief of The Army Staff. Size : About 14 x 10 inches, when closed, 28 x 10 inches when open. pictures, Hardbound with Dust Jacket. Printers : Thomson Press, Faridabad / New Delhi. India. Publishers : The Author / Photographer himself- Brig. HS Narang*. Sole Proprietor of: ‘The Spirit of India Publishers. India’. Email: IndianDesert@gmail.com Phone: 011 - 26883431.